Ashley Juchawski Rich urged young law students and attorneys to open their eyes to the spectacular growth of Miami startups and entrepreneurial ventures at the annual Global Entertainment and Sports Law + Industry Conference at Miami Law last week. The DLA Piper attorney and member of the firm’s NextGen Environment for Startups was on the kickoff panel: “Innovation Insight Speakers Series.” Her practice focuses on early-stage, high growth companies in matters related to corporate formation, business structuring, financing, and intellectual property protection. "Miami is number one in the country for start-up activity and co-working space," said the Canadian-born attorney whose practice group serves the specific needs of entrepreneurs and emerging businesses. The day continued with a lunch keynote talk including adjunct faculty Vivek Jayaram, founder and managing partner of Jayaram Law; Dennis Scholl J.D. 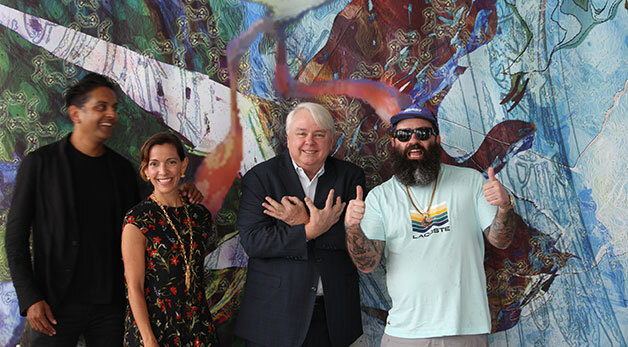 ‘81 and president and CEO of Oolite Arts; and Ahol Sniffs Glue, a Miami artist emphasizing the impact lawyers will have on art moving forward with a shift from traditional art galleries to more digitized art. These were a few of the more than 50 speakers presenting at the two-day event. The annual conference, sponsored by Miami Law’s Entertainment and Sports Law Society and LL.M. in Entertainment, Arts and Sports Law, also delved into issues facing the NFL general counsels, sexual harassment in the sports industry, and athletes as entrepreneurs. Speakers at this year’s conference included Horacio Gutierrez J.D. ‘98 and general counsel and vice president of Business and Legal Affairs at Spotify and Sally Ng, vice president of Business and Legal Affairs at NBC Universal Networks International. The Entertainment and Sports Law Society hosted its first conference in 1997. Since then, it has grown into a full-scale event where law students and professionals take part in a forum to discuss current legal issues in sports, entertainment, intellectual property, the arts, and the media. “It was so inspiring to hear from attorneys in the entertainment and distribution industries," said Carolina Borroto, a rising 2L at Miami Law. "To hear about their concerns about technological advances and the ability to adapt to the changes in media distribution helped me think as an attorney how I can cater to my client and help address their concerns in the industry.